Lavina Blossom grew up in rural Michigan. She divides her creative hours between poetry and painting (primarily collage and mixed media). She has an M.F.A. 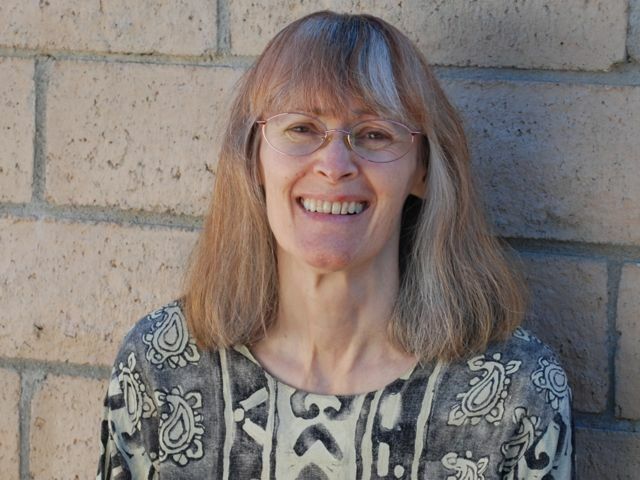 in poetry from the University of California, Irvine, and her poems have appeared in various journals, including The Paris Review, The Literary Review, and Kansas Quarterly, as well as in the online journal Poemeleon. Her short story “Blue Dog” appeared in the online journal Women Writers. She is an Associate Editor of Poetry for Inlandia: a Literary Journey. Describe your creative process generally. Do you start from the beginning, middle, or end, or a mix? Often, I have a feeling that a particular subject or idea–something I am especially interested in writing about–will lead me into a successful poem. It doesn’t always happen, but that feeling is what drives me to persist until I either have a poem or realize this is one to put aside. I rarely abandon an impulse or idea altogether. Other times, I might be most interested in taking on a challenge. For example, a friend challenged me some time ago to write a sonnet, since I hadn’t attempted one yet. I wrote several, and although I don’t think they were very good, it’s a confidence-builder to write in a way you haven’t before and discover what you will along the way. When I learned about Prompt & Circumstance, I was eager to try to shape a poem using one or more of the prompts and I am sure that generated good energy and focus. After that first flash or the first meanderings of an idea, the heart of the finished poem might have shifted away from the first lines I wrote down. It can take a while to actually find what the poem needs to be, both in its details and at its core. But that first spark will be there somewhere. For me, finding just the right ending can be the toughest part of the process. How do you go about revising a poem and when do you know when a piece is finished? Usually I revise as I draft a poem and many times thereafter. Then, I set the poem aside for a while to give myself a better perspective. An incongruity or inconsistency can seem obvious after a little time has passed–maybe just a few hours or a day, but there have been instances when I needed to be away from a piece much longer. I also paint and the process is similar. After I’ve worked on a painting for a while, I walk away and try not to think about it so that I have fresh eyes when I return. In fact, with both poems and paintings, I know to turn away and go back a few times before I can be pretty sure the thing is finished. Also, I am fortunate to be part of a wonderful poetry workshop and I take a few poems each year to this group for discussion. Having the insights of other writers (and visual artists) that I respect has been invaluable. Luckily, “stack of drawers” triggered a memory. I had a dream years ago in which bureau drawers were a kind of phone, and, as in other variations on that recurring dream, I could not get an urgent call to go through. In the process of revising, I tried to work in more of the suggested words, which was a lot of fun, and at one point I even had “muskrat” in there. But the image seemed to dominate, being a little too goofy, and it drew attention away from the message of the poem. Replacing “muskrat” with “hacky sacks,” I was able to keep the rhyme. Does your writing tend to be factual, fictionalized, or some combination of the two? What about this piece in particular? “Recurring Dream” is a narrative and my poetry often is narrative. This poem is about a personal experience, but I elaborate and invent and I was pleased that the prompts helped to bring a couple of surprising images to life. My goal is never to relate facts or stick to facts, but to write the strongest poem that I can. In this one, I wanted to capture the sense of frustration that I feel in these dreams and move closer, if possible, to understanding why I have them, or at least write an interesting poem about that mystery. What pieces or projects are you currently working on? Is there an idea you’ve had that you’ve been wanting to see come to life but hasn’t yet? I am putting together my first collection of poems for a chapbook, or hopefully, a full collection/book. To be honest, I go through a pretty fierce struggle with myself to send out individual poems and the larger project has been even more daunting. Arranging a collection well requires a great deal of consideration, focus, and time. I can come up with many other projects that allow me to avoid that work. It doesn’t help that poets are not valued all that highly except among one another. Consequently, I must keep coaching myself and recruit others to keep nudging me to get the work out there. What helps me most is being part of a small poetry workshop and exchanging poems with other friends for critique. I do believe that each of us contributes by adding our work into the broad range of poetry being published. (Still coaching myself here.) And I see a poem with a little more clarity each time I go away from it and come back. When it goes out to a journal and is returned with a rejection slip, my scrutiny is more intense. I ask myself if the poem is truly finished; sometimes I ask myself if it is any good, or good enough. And then I either put the poem aside or renew my confidence in it and send it somewhere else. I expect I’ll go through a similar process with a collection as I submit it. What was the first (or an early) work of literature you remember falling in love with? What appealed to you about the work? Unlike many writers, I did not read a great deal when I was young. Education ended for both my parent with the ninth grade. My father’s supported his family with hard physical labor. He worked full time in a foundry; he also farmed because he wanted to make his living that way and thought that someday he might. My mother raised six children and reading for her was a diversion or an escape. I think those factors contributed to literature being marginal in our household if not suspect (sitting around when there was “work” to be done). Aside from what was in school textbooks, I mostly read what was in the house, none of which was very well written. Fortunately, one high school teacher had my class read Dylan Thomas, Wallace Stevens, and a number of other wonderful poets. I was especially drawn to Thomas’s poems, although many were puzzling. I was discovering the incantatory power and the music in poems, I think. The first book of poems I fell in love with was probably “The Lice,” by W.S. Merwin. I still admire it very much. It is difficult and intriguing and speaks to concerns of mine in ways that are very moving. The book is about withdrawal and seclusion, about fear of the unknown, about natural life cycles and the relationship between other animals’ lives and our own, about survival, war, mortality, and extinction. It isn’t a cheerful book, and when I spend time with it I need to counter its effects with healthy doses of more optimistic or playful work. Some of the poems of Bob Hicok, Kay Ryan, and Heather McHugh come to mind. What is the earliest thing you remember writing? I wrote limericks, with my mother’s help, when I was very young. My mother has always been fun-loving and supportive. So, at first I wrote for the pure joy of it. I think that was a very fortunate beginning. I can’t recall the first poem I wrote on my own, but a few were published in my high school newspaper. I’m sure those were self-indulgent and full of angst. The recognition and encouragement, though, allowed me to believe I could go farther and be, possibly, a really good writer. You never “arrive” of course, and although I have had some stretches when the poems went nowhere, I kept coming back to the page, struggling to make art out of a wide variety of impulses, emotions and thoughts.